Have you been wondering what an infopreneur means? As you can guess by yourself the word derives from two words: information and entrepreneur. "Information entrepreneur. A business person who collects information from several sources, and combines it into novel ways to serve the readers' needs. The term is a registered trademark belonging to H. Skip Weitzen (author of the book 'Infopreneur') who describes an infopreneur as "a person who gathers, organizes, and disseminates information as a business venture or as a value-added service." In this post, I want to share with you what an infopreneur does, how such people make money online, what tools they use, and earning potential and costs. By the end of the post, you will have enough information to make an informed decision if this type of entrepreneurship is right for you. As there are different types of infopreneurs. I will be writing about the one who sells information products and makes a profit. I didn't say creates information products because there are business models such as affiliate marketing where a person can promote other people's products and make a commission. While many people advise that the best way to start making money is through affiliate marketing, I'd suggest you start your infopreneurial journey by creating and selling your own information products. With affiliate marketing, this is not the case. 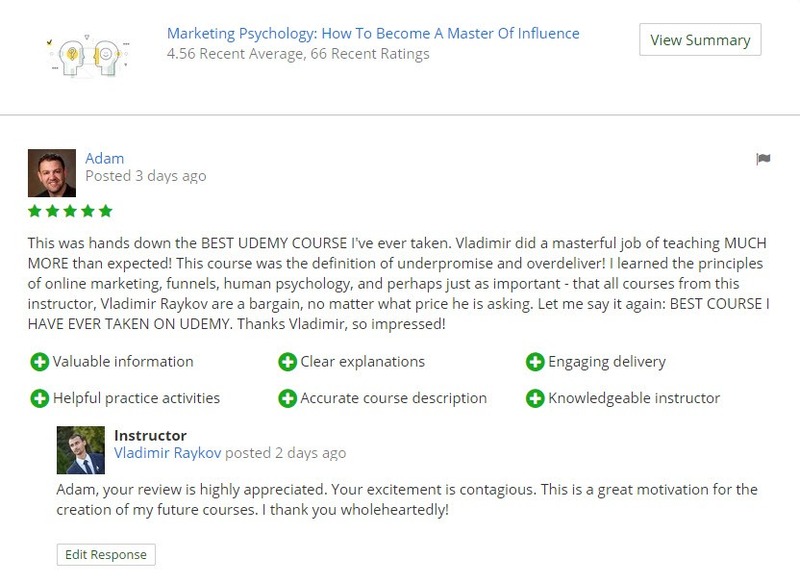 For example, a few days ago I received this review for one of my information products, an online course named Marketing Psychology: How To Become A Master Of Influence. If I was promoting an affiliate product that social proof and credit wouldn't go to me. And this is just one review but as you can see it's quite powerful. During the time I was heavily involved in online infopreneurship, I have received over 2000 positive reviews. Next time I launch an information product, let's say an online course, there are raving fans waiting to buy. Equally important, I can use the best reviews in the sales copy which is critically important to the success of an information product. Why Is It Important To Build Social Proof? Because social proof helps you sell more products and make the decision buying process easier for your prospects. That's the reason why you see reviews and ratings on Amazon, Udemy, eBay, and all of the well-established marketplaces on the internet. Social proof is the positive influence that is created when someone finds out others are doing something. What Does The Ultimate Infopreneur Do? For example, you have specific knowledge, right now, as you are reading, that would help someone solve a problem they have. That person would happily pay you to share what you know with them. The exciting part here is that you don't know where that person is, in fact, it's a group of people who we call your target audience. The internet and marketplaces for information products make it easier and faster than ever before to connect content creators (infopreneurs) with people who would pay for that content (customers). If you want to become an infopreneur, you will have to master some new skills such as creating and selling information products. You can read about these here and here. The number of information products you offer. The quality of your information products. Luckily, I if you read my blog posts, you will learn a lot more about infopreneurship than people who are already in the business know. Your costs will be determined by the type of information products you'd like to create and sell. When I say online video courses, don't picture filming yourself. It's hard to create "talking head" type of video lectures especially when you are starting out. Another drawback is the equipment you need. So, I highly recommend you start with "screencast" lectures. Read more about how to create a high-quality video lecture here. For online video courses and audio courses, you will need a good USB microphone. I'd say this investment is a must and it will pay off many, many times. I personally use Blue Yeti and it was around $130. You can go with a cheaper option. Read the section Recommended Audio Equipment from the blog post that Udemy wrote about audio quality standards. The biggest advantage is that you create your info product once and it will bring you income months and years to come (the length is determined by how timely or evergreen your content is). If you've decided to create online video courses, then you can use platforms for education which have millions of students learning from other instructors already. That's the reason why I call these platforms marketplaces. You can take advantage of these platforms when you start out and you won't have to spend money on ads but you will generate sales. The business model is quite scalable and I cannot provide a specific number as to how much money online instructors make. I've seen infopreneurs make from $500 up to $150000 per month. If you are thinking, I'm in the $3k to $5k range, doing it part time. Rob Percival is one example (out of many) of a top earner on Udemy. He has generated a few million dollars in sales and his monthly income is quite high. An article from 2015 says he was making $150000 per month (no typo). We don't know (and don't have to) how much he is making today. He is a very down-to-earth guy and I really wish him a lot of success in the future. What Tools Do Infopreneurs Use? A community of like-minded people where we help each other grow information product businesses by using proven marketing methods and techniques which result in cutting your learning curve in half. 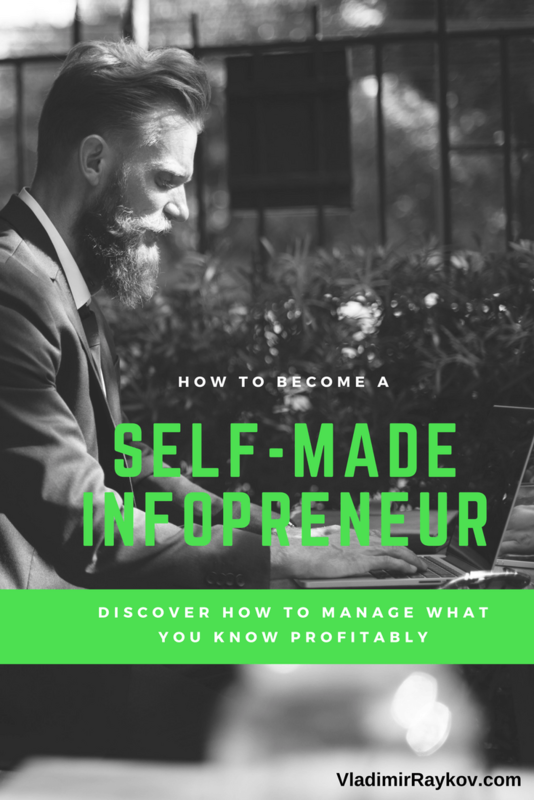 The Self-Made Infopreneur has been a dream of mine for a long time because when I started doing business online, I was alone and I didn’t like it. It took me 2 years to create the content and over $20000 in formal and informal marketing education. Oh, yes, I bought many high-end products from famous marketers. I have a bachelor’s degree in marketing and I’ve been studying Management of Innovation and Business Development in one of the best business schools in Europe - Copenhagen Business School. That’s why it took me so long to first organize and second present the content in the member's area in the most effective manner possible. And after 2 years of hard work, now the members of the Self-Made Infopreneur can establish and grow their information product businesses with ease, simply because they will be following proven systems and models. From product creation to marketing and sales, to customer satisfaction, to scaling the business, etc. Create high-quality information products that virtually sell themselves so you make sure the time you’ve invested is worth it. Implement cutting-edge marketing automation strategies so you have more time doing what you love! Build a solid audience online eager to consume your next product so you become the go-to expert in the niche you’ve chosen! Is Infopreneurship Right For You? The truth is this type of entrepreneurship is not for everyone. It requires work and mastering new skills (as I've already said). Fortunately, you can apply these skills in different online business projects. Take copywriting for example, regardless of what you sell, you can always increase conversions when you master the art and science of salesmanship in print. If for any reason you despise learning and teaching as activities, I'd suggest you don't embark on an infopreneurial journey. Even though you can see results faster than traditional entrepreneurship, it does require you have a long-term vision and be consistent. These two elements are what separate successful infopreneurs from failures. Your first information product is not just about making money, although this is the primary goal. You will learn priceless information about your target audience from the feedback you receive. You will also learn about yourself and your teaching style. All that combined will help you create a higher quality product next time. Infopreneurship is a specific type of entrepreneurship related to managing what you know profitably. Simply said, monetizing your knowledge and with time you will learn how to monetize other people's knowledge. Since we live in an information age, there is no shortage of knowledge, there is a shortage of resourcefulness. You've learned that infopreneurs transform their knowledge and experiences into information products. Generally, your information products solve problems people have and that's the main reason those people buy from you. You can start as a part-time infopreneur, allocating 1 to 2 hours per day but if you are consistent, you will notice exponential (not linear) growth in customers and revenue. Depending on where you live and what kind of job you currently have your part-time income can easily overtake your regular income. This process will happen faster if you use proven models, strategies, and growth techniques that can be found in the Self-Made Infopreneur community. Obviously, I'm the founder and I'm biased. If you don't want to join my community - that's is perfectly fine. Just find another one that will help you move faster! While looking, keep in mind that the biggest advantage is you can ask questions and get answers from experienced infopreneurs. If you've found a community that looks great but does not provide premium support to the members, I'd recommend you keep looking. The reason for that is you will have specific questions that will be unique to your knowledge and current situation, so you will need specific answers and not general fluff. If you don't have questions, please answer: What is the biggest reason that's holding you back?